WASHINGTON — The head of the Environmental Protection Agency’s office on environmental justice has resigned in protest over the Trump administration’s proposal to slash funding for programs that help poor and minority communities nationwide. Mustafa Ali, an associate assistant EPA administrator, helped found the environmental justice office in the 1990s and worked under Republican and Democratic presidents. Ali’s resignation letter urges EPA Administrator Scott Pruitt to reconsider proposals to cut EPA’s budget, including environmental justice grants, by one-quarter. Earlier Thursday, Pruitt said he does not believe that carbon dioxide is a primary contributor to global warming, a statement at odds with mainstream scientific consensus and his own agency. Pruitt said measuring the effect of human activity on the climate is “very challenging” and that “there’s tremendous disagreement about the degree of impact” of carbon dioxide and other greenhouse gases. Pruitt’s view is contrary to mainstream climate science, including NASA, the National Oceanic and Atmospheric Administration and the EPA itself. 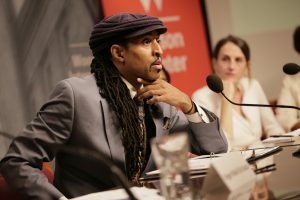 Left: Mustafa Ali speaks at an event last June at the Wilson Center in Washington, D.C. Photo by Environmental Change and Security Program/flickr.